Just saw a film called The Promise. I think it was a hopeful award contender that just did not receive critical acclaim so it flew under the radar. Oscar Isaac, Christian Bale and a slew of cameos from a well known supporting cast. Fictitious love story set on a historical event. It was an epic film. Haven't seen such a high budget film on something other than sci fi in a long time. It was sad and not necessarily award worthy, but a joy to find such a gem at home. I thought this was so depressing. Initially I was wondering if this was a dark comedy or a drama. I still am not sure. That being said, the performances were solid and I really enjoyed it. It felt a little like Wes Anderson to me in spots. Pleased to see a female director at the helm. You are spot on my friend as IMDB.com called it Comedy, Drama...it seems even the critics could not put it in just one category. "In 1942, a Canadian intelligence officer (Brad Pitt) in North Africa encounters a female French Resistance fighter (Marion Cotillard) on a deadly mission behind enemy lines. When they reunite in London, their relationship is tested by the pressures of war." Worth a watch at home on your DVD player or fave movie channel. "An FBI agent teams with a town's veteran game tracker to investigate a murder that occurred on a Native American reservation." Out for five weeks this flick has not done well at the box office, but has picked up some speed recently because it is so very well made and acted and the few peeps who have seen it speak highly of it...IMHO. ALERT FOR JEN: An animal is shot during the first five minutes...cover your eyes and enjoy the rest of the movie. ALERT FOR JEN: An animal is shot during the first five minutes...cover your eyes and enjoy the rest of the movie. Thank you! I really want to see this. I've heard good things. I will totally cover my eyes. Speaking of animals being killed, I finally saw The Zookeeper's Wife. It was good. I pretty much like Jessica Chastain in everything. Fascinating story. Poland is on my bucket list. Glad to know you liked it and so interesting to hear Poland is on your bucket list. I believe the zoo the movie depicted is still open in Warsaw. 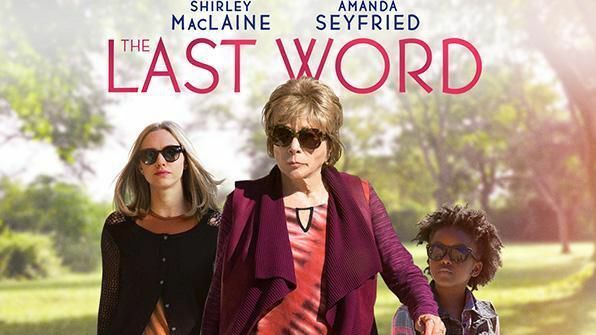 "Harriet (Shirley MacLaine) is a retired businesswoman who tries to control everything around her. When she decides to write her own obituary, a young journalist (Amanda Seyfried) takes up the task of finding out the truth resulting in a life-altering friendship." "Based on the true life story of a young Marine corporal whose unique discipline and bond with her military combat dog saved many lives during their deployment in Iraq." You have to fill me in. Does the dog die? Do any dogs die? Is the dog hurt or at any point will I be crying my eyes out? I saw Stronger. Jake Gyllenhaal was incredible. I really expected an inspirational story, tragedy to triumph, etc... Although he certainly prevails, there is no sugarcoating this story. Great performances The film was raw. I expect its very much true to life.